A backyard provides a great place for outdoor activities, entertaining and relaxation. If you’re lucky enough to have a spacious property, you have endless backyard landscaping options, but what can you do with a small backyard that offers limited space? If you live in a populated Bergen County suburb or a condo in the city, your backyard space may be small and compact, but that doesn’t mean you can’t enjoy it. With a little imagination and creative design planning, you can turn your small backyard into a small oasis. Take a look at 15 small backyard landscaping ideas that will create an inviting, comfortable outdoor space. Small backyard landscaping ideas can be challenging when you have a small backyard. You may not have room for a large patio or deck, but you need to create a small gathering area where you can relax and entertain guests. By using pavers or modular floor tiles, you can design a small patio area for relaxation and entertaining. You can find outdoor pavers in concrete and stone that can be installed quickly without grout, since their weight will keep them in place. Choose a comfortable spot near the house or in the yard. Cover the area with sand or landscaping fabric to provide a level surface for your pavers, then lay them down end to end. That’s it! You have a patio space for immediate use. If your home or apartment has a small, unattractive patio, you can create an updated look with snap-in deck tiles. Hardwood outdoor tiles and wood patio tiles are perfect for resurfacing old or worn outdoor flooring surfaces. They’re beautiful, durable and made for the outdoors. Tiles are quick and easy to install, and they come in a variety of wood tones, sizes, shapes and patterns. Just like small rooms inside your house need smaller scaled furniture, small backyards need furniture that can serve multiple purposes. Since space is limited in a small backyard, large sectional sofas, lounge chairs and dining tables that seat eight to ten guests just don’t work. Instead, you should use smaller scaled furnishings that create double-duty functions. Look for benches with storage under the seat where you can store pillows and throws. Buy comfortable chairs and ottomans that are lightweight or on casters that are easy to move around. Use side tables that can function as stools when you need extra seating or planters when you don’t. If you want to dine outdoors, look for a folding table that can be stored when it’s not in use. When you have a small patio or deck that’s showing signs of wear or is simply uninviting, adding an outdoor rug can give the space instant design appeal and updated style. Since outdoor rooms are a popular home feature now, you’ll find outdoor rugs in a wide variety of sizes, shapes, patterns and colors to enhance any type of outdoor space. Outdoor rugs are made from durable fibers like sisal, nylon and synthetic fabrics that are water-resistant, stain-resistant and hold up well in the outdoor elements. Whether you prefer florals, stripes or contemporary geometric patterns, it’s easy to find an outdoor rug that will liven up your patio or deck. You can choose a bright, bold color that adds visual interest and contrast, or a soft, serene color that blends into your landscape. Whatever your style preference, outdoor rugs provide simple, affordable small backyard landscaping ideas that will add new life to your outdoor space. Small backyards naturally offer fewer opportunities for visual interest than large yards, but using bold colors is one of the easiest, affordable small backyard landscaping ideas available. Color quickly creates contrast and visual interest. You can bring color to your patio or deck with cushions, pillows, throws and accessories, and strong color into the yard with annuals and perennials in bold, brilliant hues. For a planned, coordinated look in a small backyard, stick to two or three colors and design your entire yard with the same cohesive color scheme. In a small backyard, your grassy areas may be limited or even non-existent. If you don’t have a lawn or much room for landscaping, plant in decorative containers that will add texture and color to your back yard. Whether you want to create privacy, borders or more visual interest in the yard, decorative pots and containers make great small backyard landscaping ideas. Decorative pots and containers come in endless sizes, shapes and colors. You can create a backyard with formal symmetry, a garden area with traditional flair or a garden with natural, free-form appeal. Topiaries planted in large stone urns will provide a traditional backyard setting with sophisticated style and formal symmetry. Since Japanese maples are compact and slow-growing, they make lovely candidates for different size clay pots scattered in the yard. Galvanized containers grouped together in various heights and widths make a great way to grow vegetables and herbs. Ceramic pots and containers come in round, square and rectangular shapes and various sizes. Fill them with lush greenery or your favorite flowers for small backyard landscaping ideas that make a bold statement. Hanging baskets provide an easy small backyard landscaping ideas. They’re a quick way to add greenery and color to small patios and backyard spaces. They can be safely anchored to any type of roof overhang, free-standing structure like a trellis or arbor or even from trees in the yard. You can buy preformed hanging baskets that don’t get harmed from water or make your own from containers of your choice. If you make your own, don’t forget to provide holes on the bottom for drainage. For a burst of brilliant color, fill baskets with old-fashioned, red or pink geraniums. They’re easy to grow and grow well in hot, sunny spots. For contrast, add a flowing skirt of ivy and touches of swan daisies and blue lobelia. For a soft, natural look, plant baskets with small foliage and flowers that create fine textures and subtle colors. For classic color, choose shade-loving impatiens that will bloom throughout the spring and summer. Raised garden beds, also called garden boxes, are great small backyard landscaping ideas for growing small plots of plants, flowers, vegetables and herbs. Since they are raised, they reduce weed growth, prevent soil compaction, provide good drainage and reduce damage from outdoor pests like snails and slugs. When planting in raised garden beds, the soil stays warmer and well-drained throughout the year and is less likely to freeze in cold Bergen County winters. If you’re handy, raised garden beds are easy to build. You can also find affordable, ready-made garden beds in natural cedar, composite and plastic materials. Raised garden beds can be built in any size, shape and material that fits your yard and enhances your landscape. They provide a simple way to create visual interest, texture and color in a small back yard. As long as you have a bare fence or a blank wall, you can create vertical gardens for small backyard landscaping ideas. Vertical gardens save ground space, but still provide lots of greenery and color. With a vertical garden, you can grow your favorite annuals and perennials or edible veggies and herbs. All you need is a basic frame that works for planting in vertical rows. You can create a growing wall with a trellis, stacked wooden containers, old shipping crates, door and window frames, an old bookcase, chicken wire and various other materials. Just make sure your vertical wall is secure and plants can grow freely within the structure. If you want a backyard with unique appeal, specialty gardens can provide that, even in the smallest spaces. They create a unique focal point, as well as beauty and interest. Butterflies are not only beautiful to watch, they’re also beneficial to the environment. By growing plants that caterpillars like to eat, and plants that adult butterflies feed on, you can create a wonderful garden that protects the butterflies and promotes a healthy, green landscape. With a beautiful cutting garden, you can cut fresh flowers each day for your home. Whether you want single stems for everyday pick-me-ups or elaborate arrangements for special occasions, fresh cut flowers always inspire beautiful surroundings. Small backyards often lack interest and appeal because there isn’t enough space for trees, shrubs and plants that provide texture and color. Water features provide small backyard landscaping ideas that don’t take up much space, but provide lots of backyard atmosphere. Nothing creates an inviting, relaxing atmosphere faster than the soothing sounds of running water. Even with a small backyard, you can add a cozy fire pit on the patio or in the yard. A fire pit provides a great gathering spot for guests and added warmth and light for the backyard, so you can get outside more often throughout the year, even on chilly Northern NJ evenings. A fire pit is built low to the ground with no chimney, so it doesn’t require ventilation or a building permit. It’s basically a hole that serves as a firebox with low surrounding walls made out of non-combustible materials like concrete, stone or brick. It’s less expensive and easier to build than an outdoor fireplace and takes up much less space. It can be installed on your patio, deck, or anywhere in your back yard. If you’re looking for small backyard landscaping ideas that will add atmosphere to your outdoor space, a fire pit is a great choice. In a small backyard, it’s easy to see that the area is small unless you create a strong focal point and visual interest that captures attention. 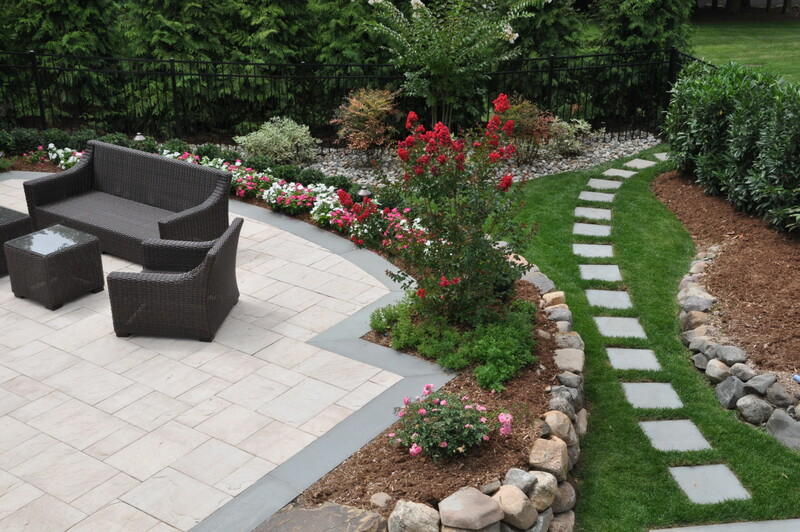 By designing beautiful garden pathways, you can actually change the depth perception of your backyard. Consider making a pathway through your backyard with pavers, stepping stones or gravel that will define a clear sense of movement throughout the area. If you have the space to divide your yard up into separate zones, make sure that you include a pathway to each zone. You can increase the visual size of a small yard by creating terraced levels that give the illusion of more depth and height, especially in yards that are long and narrow, hilly or sloped. Terracing in the landscape creates mini-gardens and helps to prevent erosion. If your yard is hilly or sloped, terraced levels will help with drainage problems and prevent runoff down the slope. Hillside terrace gardens are an attractive addition to the landscape and can be planted with a variety of evergreens, native plants, succulents, ground covers, annuals and perennials. Even with a small backyard, outdoor storage is important for garden tools and equipment, especially if you don’t have a garage or basement. You can purchase a pre-made storage shed or get creative and make your own with a little imagination and the right tools. A small storage shed will provide a perfect spot for a variety of outdoor essentials that you can’t store inside. If you don’t need to store garden tools and yard equipment, you can use it as a potting shed for all of your gardening needs. Landscape lighting is one of the easiest and most affordable small backyard landscaping ideas. It instantly adds visual interest to any size yard. It provides a soft glow that creates mood and a comfortable atmosphere. Landscape lighting allows you to highlight focal points in your landscape and interesting architectural features on your home. It also enhances home safety by preventing slip and fall accidents and protecting against unwanted intruders. Landscape lighting comes in a wide variety of low-voltage, LED, halogen and solar fixtures in beautiful outdoor finishes. Uplights and downlights are great for accenting trees, plants, garden beds and architectural features on your home. Pathway lights provide extra light and safety for walkways and garden pathways. Motion detectors provide home safety alerts for unsuspected or unwanted visitors.